The South Africa National Team is the first to qualify to World Cup 2010, as hosts. South African players wore the new away kit for the first time when they defeated Norway 2-1 Saturday, 28th March 2009, during the Nelson Mandela Challenge match in Rustenburg. "Following our successful launch of the Bafana Bafana home kit in November 2007, we had to prepare a special design for the FIFA Confederations Cup, something that South African people would remember for a long time," says Zobuzwe Ngobese, the PR Manager at adidas South Africa. The unique jersey design was inspired by the current above-the-line campaign that adidas is running to promote adidas Kopanya Official Match Soccer Ball. 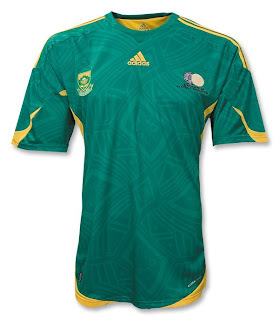 The jersey is green with yellow, with a strong South African style. It features the SAFA, team crest and adidas logo on the chest - adding special significance to the brands. As usual, the jersey was designed to provide comfort and improve the performance of the player. ForMotion™ technology was used in the jersey’s fabric, ensuring that adidas’ patented moisture management advantage keeps the players dry and comfortable at all times, regardless of how intense their training and match play. "Adidas is extremely excited to be at the forefront of producing world class football products and the Confederations Cup tournament is a platform to showcase our brand to the world and display our commitment to FIFA as a partner of more than 35 years," said Zobuzwe. “Our support is firmly behind our national team and we hope that the new jersey serves them well and they make the nation proud while wearing it,” he added. Bafana Bafana and Spain are two of the eight Confederations Cup teams that are sponsored by adidas and the global company will be hoping for one of the teams to reach the final. All the referees, ball boys, flag bearers and players escorts will be wearing adidas during both the Confed Cup and the World Cup.